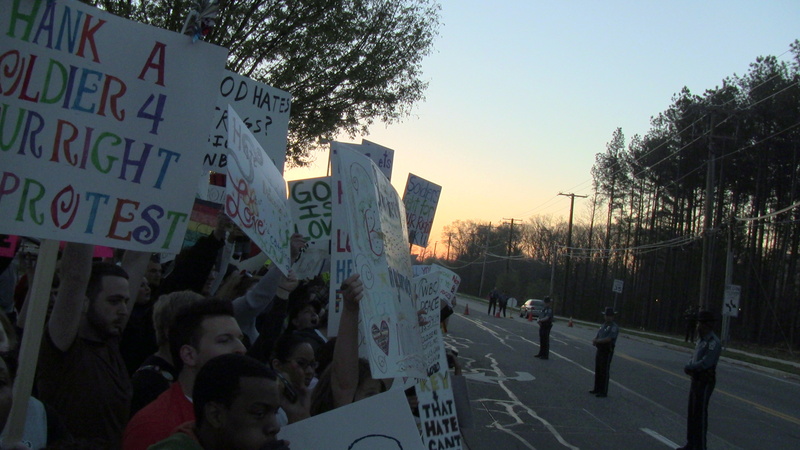 The Westboro Baptist Church picketed this morning at Meade High School. As I discussed in a post the other day, they based today’s demonstration on claims that the school has a large number of homosexual students. When they announced their intentions, a surge of counter protest movements fired up, and the result was impressive. We got there around 6:30am and already there was quite a crowd. The police closed off the road where the protest was being held, and kept the WBC & counter protesters on separate sides of the road. The Westboro Baptist Church is going to be protesting at Meade High School on Thursday morning. In a press release they stated that they’re targeting Meade because of a large number of homosexual students. The school is part of the Anne Arundel County Public School system, though it primarily serves the military community of Fort Meade. I’ll be attending a counter-protest on Thursday morning in support of the students and tolerance.